How to transfer iPhone albums to computer? Well, you might have known that transferring photos to computer is a good way to backup pictures and save the storage space on your iPhone/iPad/iPod. So this article is showing you how to transmit iPhone photos to computer (Mac or windows PC) for your reference. - Connect your iPhone to the computer via a USB cable. - Once the computer recognize your iPhone, there will pop up a promo dialogue. Choose the Import Pictures and Videos option from the menu. - Then select More Option on the main screen, click Browse option to choose the output location. By default, the imported photos will be saved in My Pictures folder. - You can give each folder a custom name before you start importing to make finding the right photos easier. - Tick out the Erase after Importing if you want to delete the photos off your phone after transferring and free up enough space. - Now, start to transfer photos from iPhone to computer by hitting Import option. - After the file transfer is finished, you can check your recently imported pictures by Windows Photo Gallery. - Get your iPhone connected to the Mac computer and then open Image Capture option on the Mac computer. - Select your iPhone from the Devices list. You can find this list in the left panel. - Then click on Import To option at the bottom of the window and select the output location as needed and wanted. By default, they will be transferred to your Pictures folder. - Now, you can can select specific images that you want to transfer, or you can just transfer all of them at once. - Click on Import option to begin the photos transfer from iPhone to the computer. If you had transferred your albums from your iPhone to your Mac or Window PC, you'd still have your photos and memories. 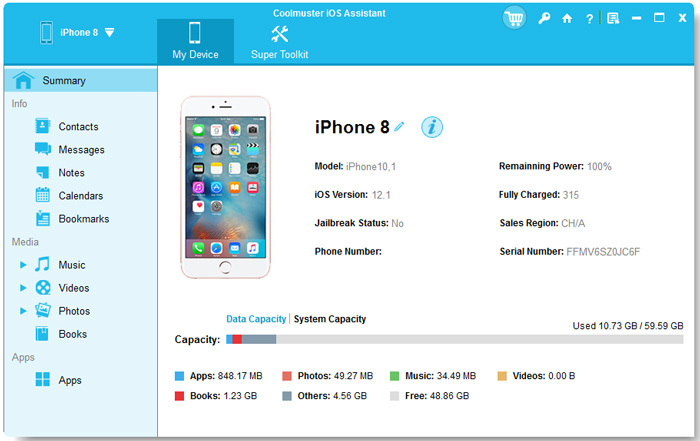 This is why Coolmuster studio created one of the best Apps - Coolmuster iOS Assistant to transfer iPhone albums to Windows or Mac computer. They know just how important your photos are to you and their Coolmuster iPad iPhone iPod to Computer Transfer is designed to be easily installed and simple to use. In most instances, it only takes a click of the mouse to save all your photos or any other information, such as eBooks, music, movies, TV shows, audiobooks, ringtones, voice memos, photos, contacts, notes, bookmarks, etc. that you have on your iPhone Xs Max, Xs, XR, X, 8, 8 Plus, 7, 7 Plus, 6S Plus, 6S, 6, 6 Plus, 5S, 5C, 5. The software also works on other iOS devices like iPad and iPod. You may want to know: How to transfer movies from iPad to computer, how to transfer contacts from iPhone to computer. No, we are not kidding it really is that easy to copy photos from iPhone to computer whether it is a Mac, PC, or Laptop. It can be done almost instantly after the iPhone to Computer Transfer program has been installed. The following 3-step process will illustrate this for you. We set Windows PC as example but Mac users can also follow the instructions below. Step 1. Install and run the iPhone to Computer Transfer on your PC. Connect the USB cable between you iPhone and the PC to let the program identify and scan your handheld. It will then display your iPhone info on the right and iPhone file categories on the left. Step 2. All your iPhone data has been categorized into different folders, such as music, movie, TV shows, etc.. Just go to open the "Photos" and "Camera Roll" folders, which will then display all your iPhone photos and albums. Step 3. You need only select the albums or photos you want to be copied and give a single click of the mouse on "Export" to start the entire operation going seamlessly. Your picture copy across securely and almost faster than you can blink. 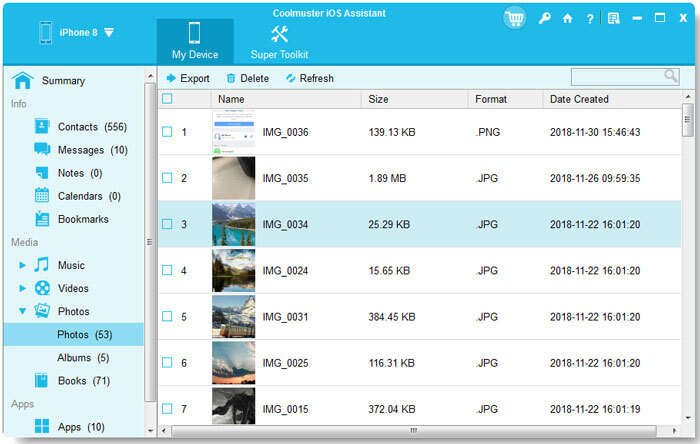 Now, you can view, organize and manipulate the images any way you want and then either copy the newly organized albums back or archive them off to a DVD. Note: Below is the video course on how to transfer photos from iPhone to computer with Coolmuster iOS Assistant for your reference.